Hear from One of Our Mentors! The 2016 Nebraska Corn and Soybean Mentor group has had a busy and eventful year! The highlight of our program so far has been our Summer Industry Bus Tour that we recently took in August. We were able to tour several agricultural businesses across the state, while learning about all different aspects of the industry. To begin our tour, we visited Hy-Vee in Lincoln for a tour of their store. 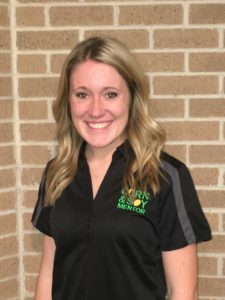 We had the opportunity to converse with a Registered Dietician, Johanna Hall, about her role in the grocery industry and the impact she has on consumers and their purchasing and eating habits. It was very interesting to hear about current consumer trends, preferences, and “hot topics,” one being the conversation regarding GMO’s. Johanna explained how consumer trends have changed drastically in recent years, and we noted that communicating the message of agriculture is becoming increasingly more important. Our next stop was at Prairieland Dairy, near Firth, Nebraska. Personally, this was one of my favorite stops on our trip! We had the privilege of getting a tour from a gentleman who had worked on this family dairy his entire life. We were able to walk through a cattle barn, watch cattle being milked, and we even were able to drink milk produced from Prairieland Dairy itself at the conclusion of our tour! We learned that Prairieland Dairy has been working extremely hard to bring the freshest, highest quality milk to consumer’s tables. One thing that caught our attention was their growing business segment, compost. In the upcoming years, they said that the compost could possibly overtake the dairy in terms of revenue for the business. The last tour of our first day was at Monsanto, near Waco, Nebraska. It was so eye-opening to get an inside look at this Dekalb seed conditioning plant. Several of us had never actually been inside a plant before! We were able to walk through the plant and follow the same path that a seed would from first being unloaded from a truck, to being sorted and treated, and finally being packaged. After spending an evening in Omaha, we began day two by visiting a transportation entity. The Union Pacific dispatching center was our first stop. This was such a great experience, as we were able to learn more in-depth about how agricultural commodities are transported to several destinations across the country. It was so interesting to see how much attention to detail, planning, and logistics goes into efficiently and safely operating railcars. Finally, our last stop of the tour was at Werner Enterprises in Omaha. We really enjoyed this opportunity, as we were able to see another mode of transportation, but this time it was trucking! Both of these tours reminded us how important transportation is to the agricultural industry. Without it, our industry would not be as expansive as it is today. All ten mentors had an outstanding experience on our industry tour, and our eyes were opened to several aspects of agriculture that often times we don’t think about on a daily basis. My favorite take-away from our tour was the idea of collaboration among industries. If we want the agricultural industry to be successful and sustainable in future years, it is so important to communicate with all industry partners, whether those are grocery store dieticians, dairy farmers, or even dispatchers at Union Pacific. Working together is what will allow the agricultural industry to thrive. LINCOLN, NE – The harvest season is upon us. Temperatures are dropping, spider webs are flying and farmers across the state are busy harvesting this year’s crop. This is a hectic time of year and farmers have a huge amount of work to do, within a very short window of time. As farmers work diligently during the busy harvest season, Nebraska Corn is encouraging them to have a safety first attitude and take the extra second for safety. Last week we recognized National Farm Safety Week—but Nebraska Corn emphasizes that farm safety is a priority that should be recognized every day. Agriculture remains one of the more dangerous occupations in North America, and this is especially true during the busy harvest season. The urgency to get the crop out of the field in a timely manner, can lead to more accidents during harvest than at any other time during the year. This reminder isn’t just for farmers alone, added Merrell. He also cautioned motorists driving on rural roads to use extra caution during harvest. These roads see additional traffic during harvest, which increases the chances for accidents to occur between slower moving farm equipment and vehicles moving at faster speeds. Rural intersections will have heavier-than-normal travel and dusty conditions may limit visibility, as can sun glare in the morning and evening. Standing crops in the field may also block a clear view of oncoming traffic. Nebraska Corn encourages farmers to pay special attention to the safety features of their equipment, and encourages everyone to keep an eye toward safety on the highways and byways this harvest and year round. Stay alert. Take breaks to help avoid fatigue — get out of the cab and walk around every few hours. Keep your cell phone charged so you can communicate as needed with family members and employees. Use extra caution around PTO’s. Check that PTOs are well protected to avoid contact with clothing or people during operation. And never step over a rotating PTO—a few extra steps to walk around the tractor are worth the effort. Shut down before working on a machine. If the combine becomes clogged, shut off the motor, not just the header, before attempting to unplug it by hand. Be aware of your surroundings. Know where your co-workers and family members are at all times and always be aware of power lines that you can come in contact with while moving equipment and augers around grain bins. Visibility can be especially poor around large machinery and at night. Grain Bin/Handling Safety. Grain bins deserve special attention and caution when grain is being loaded and removed. Never stand on grain that is being or has been moved. Safety measures should be put in place to avoid any risk of entrapment and suffocation. Move Machinery Safely. Make sure your Slow Moving Vehicle emblems are in good condition and properly mounted. If you must move machinery on a roadway after dark, have all necessary working headlights and flashing front and rear warning lights. The better you can be seen the less likely you are to be hit by motorists. Develop Safety Rules. Have a set of safety rules for everyone to follow – and enforce them. Protective eye and ear wear is important in many situations. It is also important to equip tractors and combines with a fire extinguisher, as dry crop residue is fuel for a fire. Finally, ensure that trained family members and employees are operating powerful equipment—if kids want to be involved, give them age appropriate jobs. Public Policy and International Relations Internship– Washington, D.C.
Intern will obtain a working knowledge of office operations of the US Grains Council (USGC), meet USCG leadership and support their efforts, develop inter-relationships of other ag and ag industry groups in D.C., hands-on work with the Council’s members, build an understanding of trade policies in the U.S. an other countries, see the importance of working with membership cooperators, and assist with coordinating international trade teams. Public Policy Internship– Washington, D.C.
Intern will obtain a working knowledge of office operations of the National Corn Growers Association (NCGA) at their DC office—working with grower membership lobbying. They will gain knowledge of various bills and policies important to corn growers, the process of influencing legislation and lobbying experience and hands-on work on the Hill. Intern will obtain a working knowledge of office operations of the National Corn Growers Association (NCGA) at their headquarters office in St. Louis. They will have opportunities to represent NCGA as assigned in meetings, meet NCGA leadership and support their efforts, gain knowledge on issues affecting corn farmers, and along with building an understanding of market development, research, membership, communications and business development. Intern will obtain a working knowledge of administrative duties, read and analyze market trends and current events from global offices, assist with coordinating international teams visiting the U.S., represent U.S. Meat Export Federation (USMEF) at various industry meetings/events and report back to MEF staff, research consumer trends in foreign markets for various staff presentations and visits, and opportunity to meet with USMEF members and executive committee. Intern will obtain a working knowledge of international office operations of the USGC or the USMEF, inter-relationships of agriculture and other ag industry groups in the host country, trade policies in the host country and how they affect the U.S. and other countries, knowledge of international trade policy, market development, value of international trade, global food security, grain supply and reliability, biotechnology, and much more. Assist and coordinate communication projects at the Nebraska Corn Board (NCB), assist with representation and set up at trade shows and events as needed, assist with market development programs, assist with outreach programs and activities, collect and report corn and corn product utilization and transportation data, and assist with various duties in the office. Year-long Internship (May 2017-May 2018). Interested in one of the above internships? Assist and coordinate communication projects and efforts to enhance Nebraska Corn Growers Association’s (NeCGA) legislative efforts. Develop and implement internet based communications programs, including: e-newsletters to members, managing social media programs, updating NeCGA’s website. Assist Program Director with event planning and various projects in the office. Year-long Internship (May 2017-May 2018). Interested in the above internship? 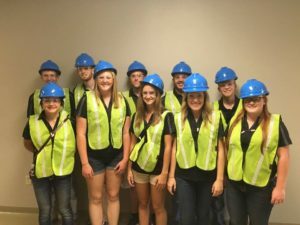 During the course of this year, 10 University of Nebraska-Lincoln students are getting the chance to learn more about the agriculture industry as part of the Corn and Soy Collegiate Mentoring Program. Through this programs students learn about state and federal policy issues affecting agriculture, what the Corn and Soybean Checkoffs do, the importance of the commodity membership organizations, as well as future opportunities in agriculture. A highlight of the year is the Corn and Soy Mentor Industry Tour. 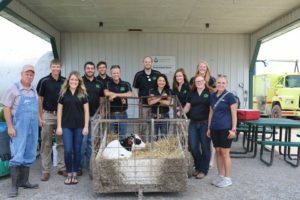 This tour gives students an opportunity to utilize their agvocacy skills, gain knowledge, network with industry professionals, and explore careers in different ag related fields. The tour took place August 18th and 19th around the Omaha and Lincoln area. The first stop was at a Hy-Vee store in Lincoln where students had a chance to visit with an in-store dietitian. Here the group was able to learn about consumer trends in food choices, frequently asked questions about foods containing GMOs and other “hot topic” questions, as well as how important it is to be an agvocate. Prairieland Dairy near Firth was the next stop of the tour where the mentors were able to see how a dairy farm operates. The hour and a half long tour was led by one of the founders of the dairy. The mentors were able to see many facets of the operation including the milking parlor. For many this was their first experience with a dairy farm. The afternoon of the 18th was spent touring the DeKalb Monsanto Plant near Waco. Some of the students had been on detassling crews but had never seen the other side of seed corn production. Unfortunately, the group was there a week or so too early to see the plant in full swing, but it was amazing to see everything that goes into getting those bags of seed out the door. The students were also able to talk with the tour guides about the different job opportunities available with DeKalb and Monsanto. To start the Friday portion of the tour, the group met up with the Pork Mentor students at the Union Pacific Harriman Dispatching Center. The group was given a “behind the scenes” tour of the dispatching center and learned just how important rail transportation is to the agricultural industry. Finally, the tour concluded at Werner Trucking in Omaha. This stop gave students an opportunity to learn more about the trucking industry and how it relates to agriculture as well as speak with the Director of Government Relations about the current issues the trucking industry is facing that can also translate to the agricultural industry. 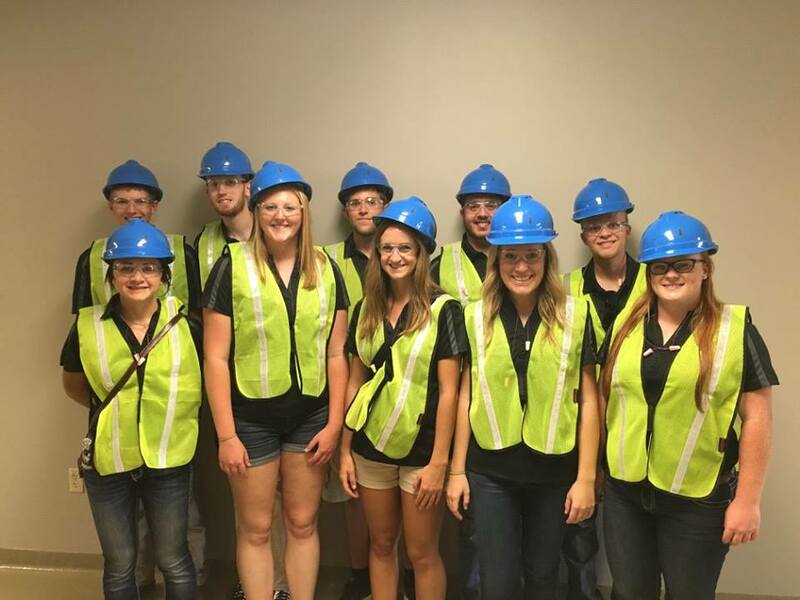 The 2016 Mentor Tour gave students an opportunity to learn more about the agricultural industry and how many companies are indirectly related to agriculture. Wyatt Williamson, a member of the program, said that “The bus tour was a great way to see the agricultural industry from top to bottom.” The 2016 Mentor Program would not be possible without help from the Nebraska Soybean Board and the Nebraska Corn Board. Nebraska Corn is busy preparing for Husker Harvest Days! This year HHD is September 13th – 15th. Show hours are 8 AM – 5 PM Tuesday and Wednesday, and 8 AM – 4 PM on Thursday. You can find Nebraska Corn in both 8 in the commodities building (red building on Main St.). Stop by to learn more about how Nebraska Corn is adding value to the state and to sign the petition telling the EPA we want to keep Atrazine! Don’t forget to grab an ice cold Coca Cola, sweetened with High Fructose Corn Syrup, on your way out. Local President’s, be on the lookout for the HHD work schedule. As a reminder, all locals are asked to supply volunteers for a two-hour shift during the show. We will see you all there!